With the schools breaking up for the Easter holidays, children up and down the country will soon be demanding fun and interesting activities to soak up their energy and creative enthusiasm. Luckily, our App of the Week ticks all of these boxes and promises to entertain children (and adults) of all ages throughout the holidays. Paint My Easter Egg is a fun and simple app that really does what it says on the tin. Once you’ve selected a style of Easter egg that you would like to paint, you choose your colours and then save your egg. This may sound a bit basic, however the fun is to be had once you’ve saved your design… Let’s take a closed look at the app. In fact, we might start our own Mobilesplease Easter egg competition to see who can take the best photograph with an Easter egg taking centre stage. 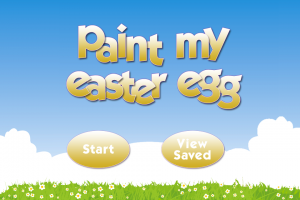 Egg Painter is a simple idea that’s translated into an easy to use app that will plenty of fun for kids of all ages over the Easter period.